Johann Franz Peter Paul was born at 28.06.1775 in Klosterfreiheit, as a son of a joiner-master. He evidented early his draw talent, when he might be helpful to his father in painting the coloured trunks and cupboards. People had told him about the Dresdner Kunstakademie (academy of arts in Dresden), and one day the sixteen years old boy makes hisself up on the way to Dresden, to get information about an admission. This admission would promised by the director of the academy, on the contrary for the permission of his father it has took some entreaties more. 1791 began the young Franz his study. In the director of the academy, Giovanni Casanova, he found a warmheartedly promotor. 1796 he got a yearly pension of 100 talers promised by the saxon prince elector. He was befriended with the art-painter Philipp Otto Runge, who changed 1801 his faculty of Kopenhagen with the faculty of Dresden to meet Franz Gareis, which he admired. Also Tieck and Schlegel belonged to his circle of friends. Maid in candle light On his way to Rome he falls sick on spot-fever, and though Wilhelm von Humbolt sent him the best doctor of the town, he died in Rome at 31.05.1803 with 28 years. He was graved at the cemetery near the Cestius-Pyramid. He left behind in his country, beside all others, his mourning intended Louise Reichardt, which he was willing to marry after his return. His last known adress was Dresden, Alter Markt 193. He applied to the portrait-painting and later to the historical-painting. The altar picture of the church of Seitendorf 'Maria Magdalena under the cross' was one of his famous works (1798) and is still findable in the church of Seitendorf (Zatonie/Poland). 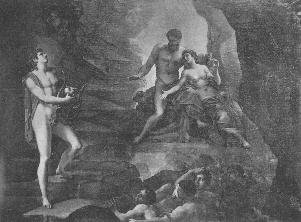 In Paris originated a further of his main works 'Orpheus - lament to the god of Hades'. He sent it to the art exhibition of 1803 to Dresden, where it found many approbation. It was last in property of countess Danckelmann in Groß-Peterwitz and is lost, too. In this connection we owe Prof. Dr. Richard Förster from the university of Breslau great thanks. In his book 'Franz Gareis', which was edited 1913 und 1916 in Görlitz, we find his history and an index of the findable works of the art-painters Franz and Anton Gareis. (Some mistakes in the genealogic attach of the birthdates of the six brothers may we excuse here.) Since this list was builded before the war, might some works lost as robbed art. The Dresdner Kupferstichkabinett (copperplate-engraving cabinet) got 1996 the 'Pensées de Franz Gareis' back from museum Kiev. The 'Chef de Bataillon au Corps Royal d'Etat-Major' H. B. Guffroy was so faszinated from Franz Gareis in Paris developed works, that he let reproduce some lithographicaly. So were made the Pensées as 56 stone-prints, which he let hand over 1820 through the saxony cabinet minister and count Einsiedel to the saxony King. This work enclosed a dedication to the King.